As she walked into his room all she could think was “Wow! He is so cute! ” She had always assumed investment bankers were so boring and uptight. The way he shook her hands proved he was uptight but she thought she couldn’t put him in the boring category. “Hi I’m Liana. I just moved to Pune and want my accounts to be transferred from Delhi to Pune. I also want some information on the different products that are there that would help me on my investments.” She knew she was speaking too fast and her hands had become cold. “Hi, I’m Donavan. Please sit down.” He said in a calm voice. He asked her for her account number and her investment time frame. As she was giving him the details she couldn’t help her mind from exploring his other features. His deep brown eyes and the little curve on his nose that gave him a rugged look, the way his mouth curved and the way his hair kept falling on his forehead. He became conscious of the way she was looking and wanted to be done with her. She looked beautiful too with sharp piercing eyes and luscious lips painted in pink. Her light blue ruffled top added to her glow. But the rule that he had made for himself “Never date your clients”, flashed before his mind before he could revel in her beauty. She scolded herself for being so distracted while she was about to be making important decision regarding her investments and promised herself that she would meet with someone else the next time. When she sat down at her desk to work she couldn’t prevent herself from looking up at “Donavan Seth” in Google. The fact that he was still single and loved to play the guitar made her day! She had never been interested in finance and always dreaded reading the pamphlets given in the banks. But she decided that she wanted to impress him the next time if she gets to meet him again. “Yep he is my man!” she thought to herself. “Good Morning.” They both jinxed together and laughed. “Okay” she said and felt like she wanted one desperately to wake herself from Donavan‘s spell. She wasn’t able to get him out of her head this entire week and seeing him today only added more to the excitement. She had taken extra care to dress up. She had worn a skin tight jeans and a white top that hugged her in all the right places and she looked stunning too. Once he came behind the desk, all his smiles were tucked in and he bore a professional front. As she was going thru her folders he couldn’t help but admire how hot she looked in that dress. “I would in other circumstances but unfortunately I don’t go out with my clients. Thanks for the invite though! Have a great weekend.” and he held out his hands to give a hand shake. Liana blushed. She felt stupid for asking him without even thinking about it. It was insulting. Even though deep inside her felt he would respond to her in this way. It so happened that all of Tina’s friends planned an impromptu visit to the beach in Goa after the party. They drove all night and crashed in the hotel early next morning. Liana woke up earlier than everyone to go for a walk along the shore. As she was getting her feet wet and enjoying the morning sun and the way it was reflecting on the water and shimmering like glass, she saw a group of men and women standing around a boat for parasailing. She felt thrilled and wanted to try it too. She wished she had woken up one of her friends to come along. Her heart skipped a beat when she saw Donavan in the crowd. At first she thought she was hallucinating, but a second look confirmed it was him. She turned around to go back to her room and hoped he hadn’t seen her. Before she could walk a few feet she heard the sound of water splashing. She held her breath and turned around to see Donavan running towards her with only a dark blue swim shorts on. Liana hadn’t imagined such a well toned body hidden beneath the suit he was wearing yesterday. Her knees became weak on seeing him. “Yes, until yesterday. But there this beautiful dame who made me bends my rule a bit only on the weekends and that too only when they are out of the city. So please don’t say no. Let’s go!” He took her hand and pulled her towards the boat before she could answer. 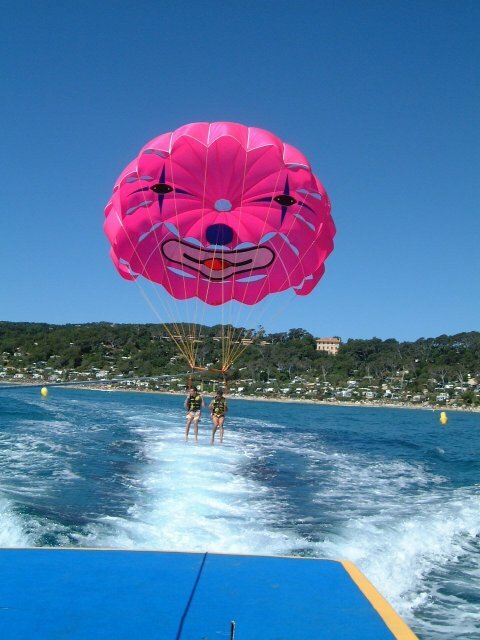 Liana had never done parasailing. She was giddy with excitement. Two people could go together on the sail and they waited in queue for their turn. Liana came to know Donavan was from Goa and he came down here once a month. His parents still lived here. He had this smirk in his lips when he talked to her and it irritated her. He nodded his head and said “Once you are up there it is just exhilarating. I promise, you will not be afraid. Just try to enjoy and be in the moment. Its fun.” He sounded like a child when he explained it. When it was their turn he held her hand and they were both tied to the harness which was attached to the boat. When they took off Liana’s stomach churned. But once they were up in the air the view was striking. She felt like a bird. When she turned her face to look at Donavan he had this huge grin on his face and he said “Didn’t I tell you this is fun?” she nodded. With the sun shone behind his back she thought she would never forget this face in her whole life and wish she would never have to. Apparently her friends had become paranoid when they didn’t find her. She saw many missed calls from them. As she turned around, her friend Akshay carried her and dumped her in the water. Then all her friends ran and started splashing around. When she looked up Donavan was very far from her. He had gone without even saying a goodbye. She felt so annoyed at him. She wondered whether he felt the same attraction that she was feeling towards him. She had come here to have fun and decided she will and started frolicking in the water. Even when she wanted to put away Donavan in a secret corner of her mind and not think about him everything made her wish he was there with her. Her mind kept going back to the fact that he left without saying goodbye and she became moody. When her friends asked her if everything was okay she just nodded and pretended she was sleepy and said that she didn’t want to head out them. It was almost 9 o’clock in the night. The full moon outside the window teased her to come out and look at him. This was the first time she was near the beach during a full moon and wondered how beautiful it was. It looked bigger and brighter and the shades of light on the water mesmerized her. The house that they had rented had a veranda with 4 easy chairs facing the sea. “Who r u?” she replied back. “Donavan” came back the reply. She couldn’t help smiling. Her friends had been teasing her all day with him; in the back of her mind she thought if it was them trying to make fun of her. “I’m at the bar with my friends.” She replied back. She was surprised that he had come all the way looking for her. She stood up to see a shadow standing 2 feet away from where she was. “Just turn around.” She texted. He walked slowly toward her and she wished she could just run to him and put her hands around his neck and hug him. But she stood where she was patiently giving him the space to respond. If he had come all the way looking for her, she was sure he felt something for her. He reached for her hand and she leaned towards him and they walked slowly towards the veranda. She felt so comfortable with him and on seeing him the feelings she was trying to hide from surfaced up. He turned towards her and held her face and said “Not as beautiful as you.” He took her in her arms and kissed her.